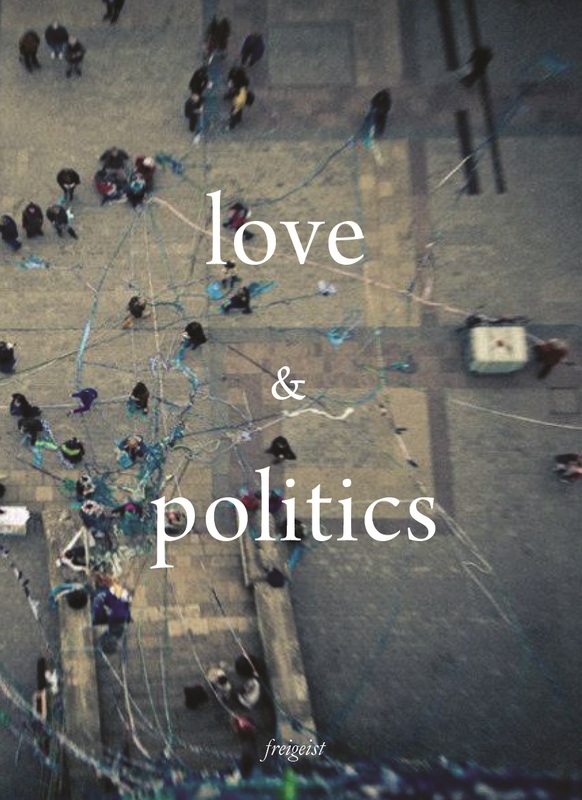 In September 2018, Freigeist Verlag launched a collective book on the topic love & politics titled homonymously. Immersed both in artistic exploration as well as in philosophical and scientific research, the project welcomed contributions from all disciplines so as to get the most diverse view on the topic. Taken as its point of departure the question of how love and politics could coexist and what kind of forms and spaces could be created out of this encounter, the project addresses the potential of this unlikely liaison. Clouds and vertical flows, children’s voices, magic protests and polemics, cyborgs, floating cities, rhizomatic braids and dancing soldiers, anarchist diggers, feminist mystics, hybrid fish and mermaids, satellites and astronauts … This book works like a synaesthetic jukebox of yet unknown possibilities. You may read it like a picture book or like an academic journal. You may start at any contribution and synaesthetically relate it to any other: the possible amount of fusions goes far beyond our possible intentions.